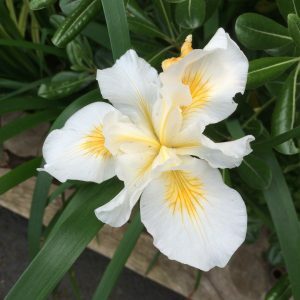 Pretty, floriferous and reliable form of Pacific Iris that forms large impressive evergreen patches and in April/May large white flowers with a touch of yellow on the lower petal. To 18″ and spreading to form large colonies in full sun to quite a bit of shade. Virtually any soil. Tolerates summer irrigation if the drainage is excellent otherwise follow a dry summer regime. High deer resistance. Evergreen. Oregon native plant.